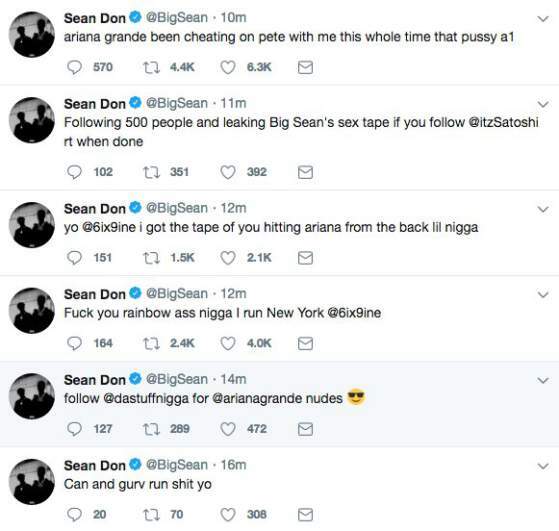 Big Sean briefly had his Twitter account hacked by a lame who tried subjecting him to mindless celebrity controversy. The hacks began this morning with a tweet threatening to reveal Ariana Grande nudes, while also claiming she'd been double-timing her current beau with none other than Tekashi 6ix9ine. The hacker asked for a meagre return of 500 likes to get the "party" started. All images were captured via Big Sean's Twitter before his account was recovered. The hacker's language didn't exactly fool anyone on Twitter, the plausibility of his claims far too outstretch, even given he and Ariana shared a past relationship. Even so, Twitter users were quick to memefy the best and the worst of the ordeal. One user even summoned a jet skiing Jigga man into the discussion. Incidentally, bare footage of Big Sean reading mean tweets on Jimmy Kimmel was used against him. Some users took a tad too far when they dragged the bereavement of Big Sean's late grandmother into the discussion. There's absolutely nothing wrong with being a Grandmama's boy. Being a mama's boy on the other hand doesn't give you a free pass. The most harmless quip made about the hack job were a series of Tweets like the one below which poke fun at Big Sean's perceived mediocrity.